St. Louis native and Ohio-based Artist David Michael-Strickland Butler has situated himself within the narrative painting tradition. He attained his BFA at the Columbus College of Art and Design, and his MFA at The University of the Arts, Philadelphia, PA. Butler's work engages the visual essence of Blackness in culture, placing Black figures in environments and narratives to provoke dialogue on identity, and increase awareness of the contributions of the Diaspora to Global Culture. He has a reputation of enhancing creative academic experiences. His philosophy is that artists, educators, and creative professionals have a responsibility to engage, challenge, and support community. His recent focus is exploring Black perseverance throughout our history. His paintings often refer to social issues, pop and mass culture. He uses art as a form of activism, exploring how social justice, identity, capitalism, power and violence affect people of color. He has done work for clients such as Price Waterhouse Cooper, Ohio State, Ithaca College, Soulo Theory Creative, National Association of Black Accountants, The King Arts Complex, COTA Bus Line, and Miami University Oxford, Ohio. As an educator, Butler has taught at University of the Arts, Miami University, Oxford, and Columbus College of Art and Design. 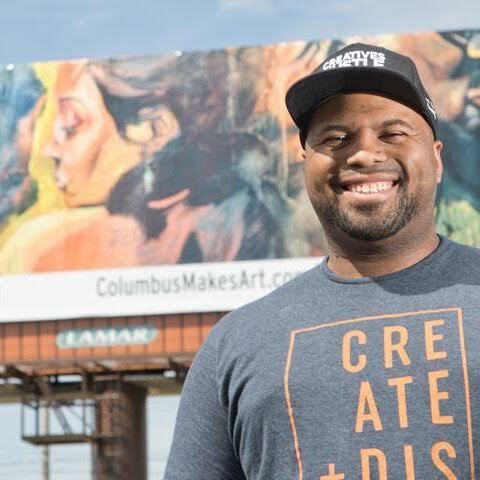 He currently works in Columbus, OH with Youth,Teaches in the Illustration Department, and continues his studio practice at the Artfleuntial Workshop and DavidMichaelArt.com.